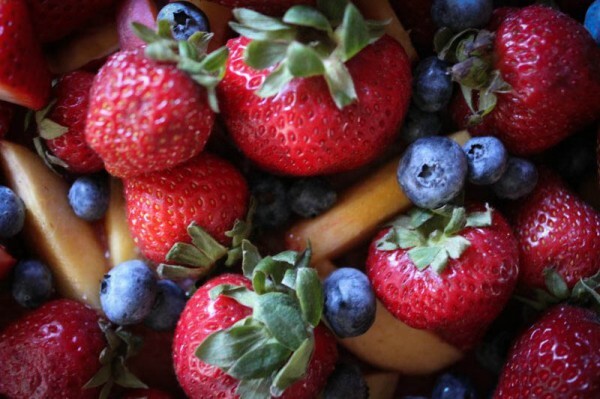 Summer fruit is the best. There are a great many things that come close: napping in front of the fireplace in the winter, diving into a lake, the first time you comfortably wear jeans and sweaters in the fall, getting retweeted by a celebrity. 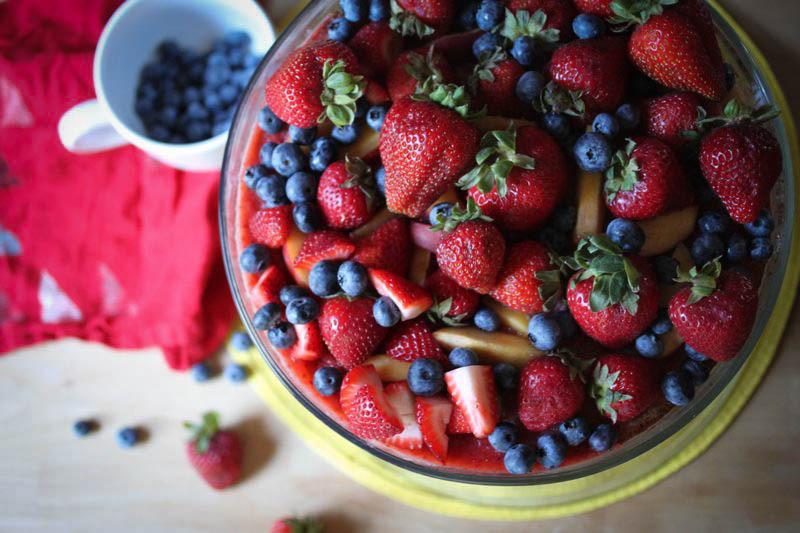 But really, summer fruit is the bestl. I’ve said this a great many times for so many of the recipes, but I’ve been so excited to make this dessert since I got my hands on this cookbook. Layers of pastry cream, fruit and cake?! 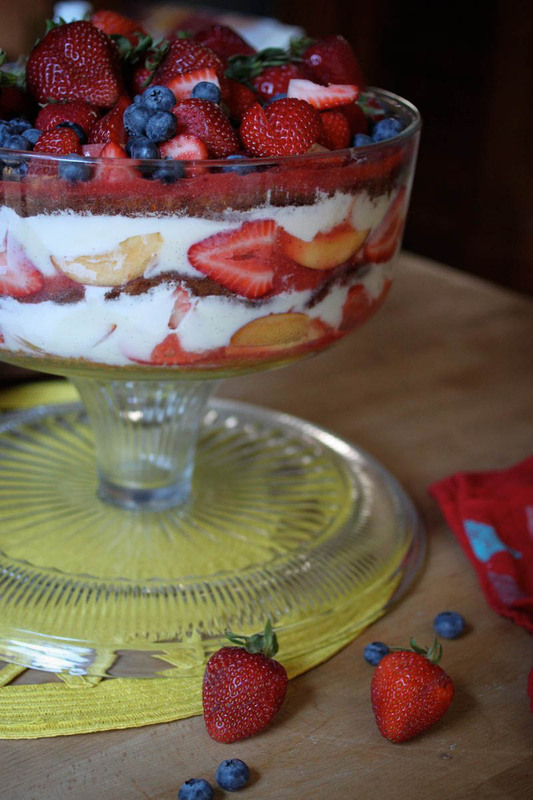 This trifle is a dream! And speaking of trifle, all I could think about throughout every step was the term “triflin.” When I first started teaching, this was a word I heard so much describing lazy group members, frenemies, ex-boyfriends/girlfriends, characters in stories they weren’t fond of, etc. It took me awhile to know what students were talking about, there was so much slang that was a foreign language to me. In one of my sneakiest teacher moments, I had all my students create “Slang Dictionaries” in order for them to explore their personal language. Really, I wanted to know what in the world they were talking about. I still have a few of the dictionaries they made because the results were HILARIOUS! 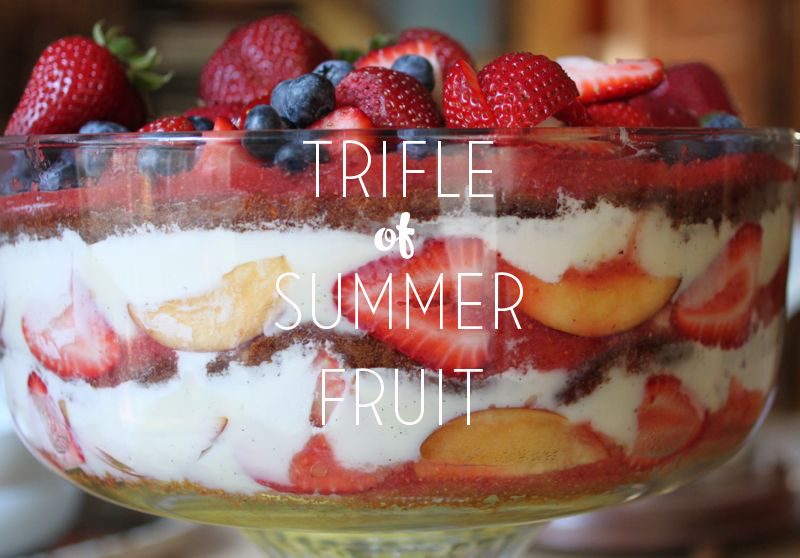 This sweet treat may be a trifle, but it certainly isn’t triflin’. So many dishes were made dirty through the processes of making cake, pastry cream, whipped cream, fruit purée, chopping fruit…I did use my new whisk I thrifted over the weekend, and it was wonderful. 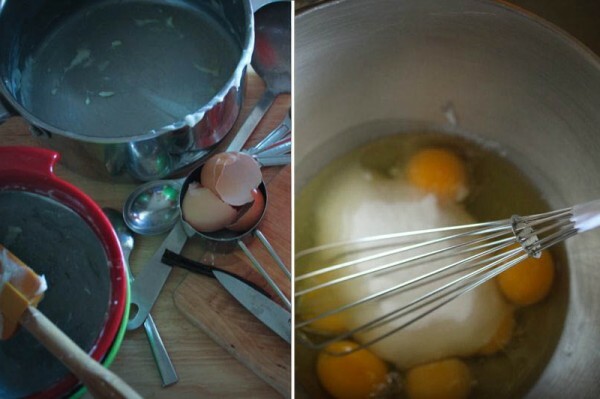 You may think a whisk is a whisk is a whisk. BUT! There’s a difference in how sturdy they feel in your hand. I love my new, sturdy whisk and was happy to break it in! 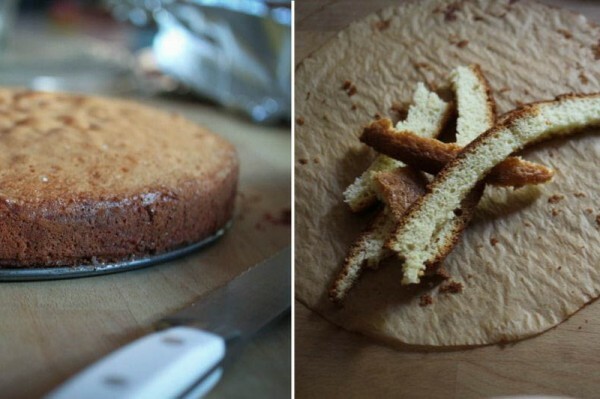 The génoise is basically a sponge cake because you don’t use any chemicals to make the cake rise It ended up working out well after some serious concern. You basically use air to fluff up the batter before it goes into the oven, but as I was folding things in, it began to deflate extremely fast. I blame the heat! CURSE YOU, HEAT WAVE! So, I think that’s why my cake turned out pretty thin. I’ll have to make it again, of course, to see if blaming the heat is a viable out for this one. 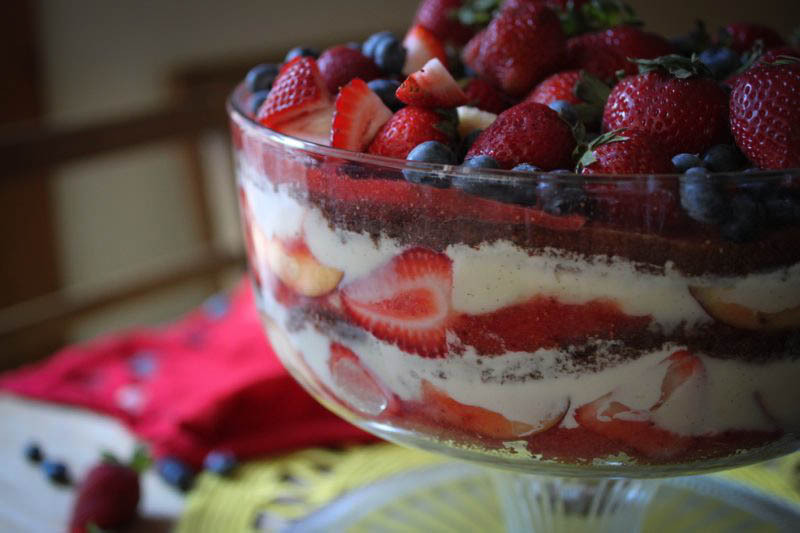 The dish I used for the trifle is amazing. More often than not I use it as a cake stand. Yes. The bowl is the lid, and you flip over the base and that’s where the cake sits. I’ve used it like this only as a punch bowl. Such a clever design! Piling up the components into this smart bowl was the quick and easy part. I quickly realized how much dessert I had on my hands and planned a last-minute dessert party. This is the first time I’ve shared my final product on my blog before it’s actually been eaten. I don’t feel like I’m cheating or anything because I did create a little amuse-bouche for myself as I was layering up the goods, and it was delicious. An amuse-bouche is a single bite-sized serving, something like an hors d’oeuvre. Since I gleaned this information by watching Top Chef, I’m not sure is desserts qualify as such, but it works for me. I look forward to a million consecutive amuse-bouches when I dive into this trfile of summer fruit later today! This looks so tasty and perfect for summer! And not cool about the heat bullying your cake! I bet everyone loved this. Pasty cream is one of my favorite components of dessert so much so that I’m making another “peaches & cream” pastry later this week that I won’t have to share with anyone but the boyfriend. Piggy? Yes, but whatever. It’s summer and I can’t let my peaches go to waste. Gorgeous! My husband is from Ireland and he LOVES a trifle, so I must get on this recipe. 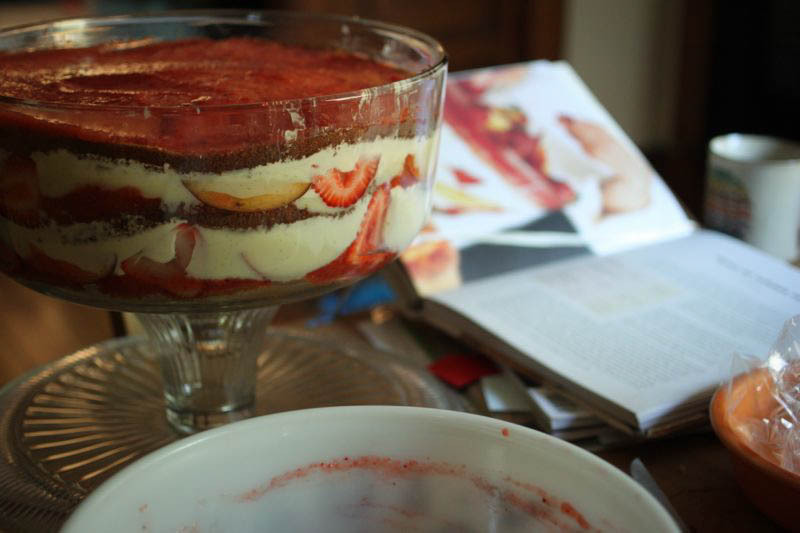 the trifle look delish and all but i’m interested in these slang dictionaries you possess. must see.